Once synonymous with practical knitwear and granny pants, Marks and Spencer is the Great British high-street favourite that has undergone a dramatic transformation over the last two decades. Now, every new-season drop is covered by high-end fashion publications, and it is more than acceptable to declare that your trousers are, in fact, ones you picked up from the local M&S. We've seen more than one sellout success from M&S's collections over the last 12 months. Be it the polka-dot jumpsuit or the Who What Wear editor–approved herringbone wrap coat—both of which flew off the shelves and restocked multiple times—clearly, they're doing something right. And this season is no different. But rather than one winning item, we've spotted a whopping 22 pieces that have set our pulses racing. Where do we start? M&S is all over tailoring this season, and we've made a mental note of a number of chic suits that come in delicious shades of pastel. There's also a surfeit of linen separates that are begging to be packed for your summer holidays: Highlights include a classic pair of belted shorts and a lilac button-up midi dress which, in our opinion, wouldn't look out of place in a designer lineup. So much goodness, so little time. Scroll down to see and shop the Marks and Spencer pieces that are destined for cult status this summer. 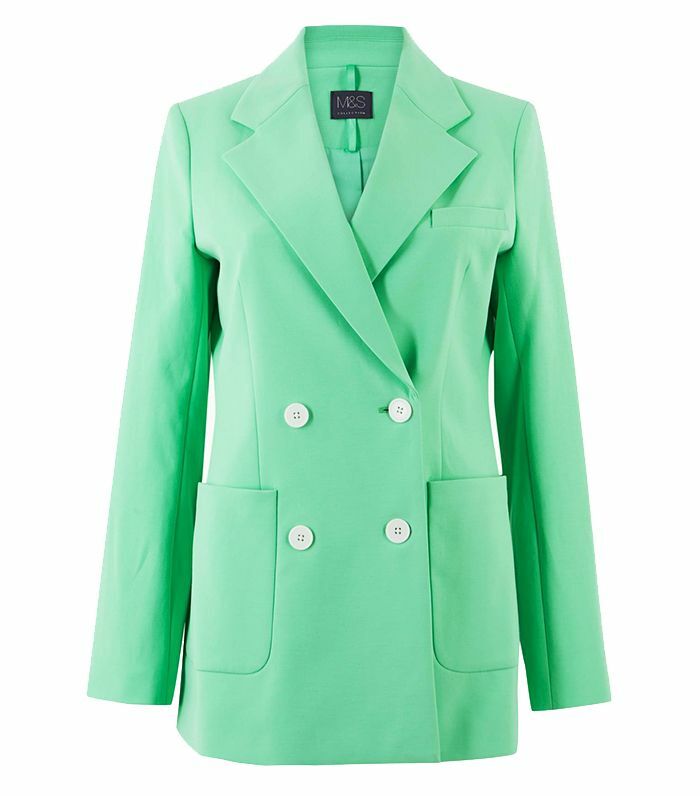 Green suiting is having a moment, and this mint-hued look ticks all the boxes. Complete the set with these straight-leg trousers. Classic and flattering, straight-leg trousers are at the top of our summer packing list. Everyone's been talking about this utility boilersuit. If you buy anything this spring, make it an oversized trench. Wear with a white tee and patent boots. The cut of this skirt is so expensive-looking. Wide-legged is the only way to wear your denim right now. A stand-out midi in a figure-flattering fit. Tuck this into high-waisted flares. This is perfect for both work and play. We love the contrasting stitching on this short-sleeved jumpsuit. A new-season staple if we ever saw one. This can be dressed up for dinner or down for daytime. Cardigans are no longer frumpy, especially when they feature balloon sleeves. The androgynous short-sleeved shirt still feels stylish this summer. Pair with knee-high boots and roll-neck while the weather is still cool. A safari shirt will never feel outdated. We've been looking for tailored shorts for ages, and these might just be the answer to our prayers. Style with everything from denim to midi dresses. The 1950's favourite fabric is back and better than ever. Try layering this dress over tailored trousers.